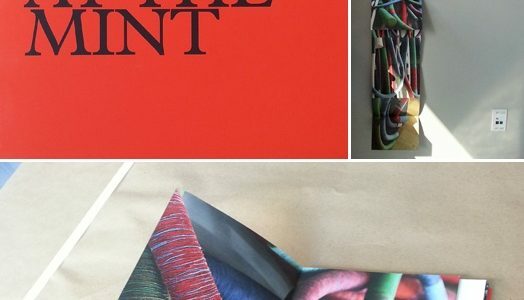 In a unique collaboration combining art and scholarship, The Mint Museum has published a new book in association with Yale University Press titled One Work, which will be available for sale to museum visitors beginning with the Democratic National Convention activities on September 1. The volume, totaling 100 pages including photos, is devoted to the massive four-story work hanging in the atrium of Mint Museum Uptown, Mega Footprint Near the Hutch (May I Have This Dance?) by Sheila Hicks. It contains two pullout accordion folds with images of Mega Footprint on them and a hanging loop embedded into the cover, enabling readers to literally hang the book on their walls and enjoy the book itself as a work of art. The book was designed by internationally renowned Amsterdam-based designer Irma Boom, who won the 2007 Gold Medal at the Leipzig Book Fair for “The Most Beautiful Book in the World” for designing Sheila Hicks: Weaving as Metaphor, published by Yale University Press. One Work includes a foreword by Dr. Kathleen V. Jameson, President & CEO of the Mint; an essay by Annie Carlano, director of Craft + Design; an afterword by Rodolfo Machado of Machado and Silvetti Associates, architects of Mint Museum Uptown; and photos by James Martin, Digital Media Manager at the Mint. The Mint acquired Mega Footprint Near the Hutch in fall 2011 through a generous gift from Target Corporation. The company originally commissioned the work for its Minneapolis headquarters, where it was first named May I Have This Dance? A redesign of the headquarters prompted a search for a permanent new home, and the Mint was among many of the nation’s largest and most important museums considered for the gift. Its distinctive tubes, made of linen thread wrapped around plumbers’ pipe insulating foam, were reconfigured for the atrium space of Mint Museum Uptown. Its new title referred to Charlotte’s “mega footprint” of growth near the “hutch,” used as a synonym for animal pen, and referring to Charlotte’s proximity to still-rural countryside. The newly reimagined work was unveiled concurrently with the opening of Sheila Hicks: 50 Years, a retrospective organized by The Addison Gallery of American Art that was on view at the Mint from October 2011 through January 2012. Hicks is considered one of the world’s leading contemporary artists and designers, known for her work with thread and textiles. One Work is on sale for $40 at both Mint Museum Shop locations and is also being distributed internationally by Yale University Press. All proceeds from sales at Museum Shops benefit The Mint Museum. For more information or media review copies, contact Leigh Dyer at leigh.dyer@mintmuseum.org. Click here and click on the second highlight image to see more about Mega Footprint Near the Hutch.